Fish Kalia is a Bengali royal fish curry that is a must have dish on wedding menu(or any big occasion). The preparation is really simple and easy. 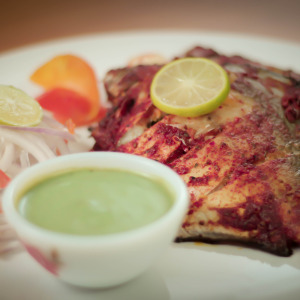 First fry (shallow-fry or deep-fry) the fish pieces in mustard oil and then put them in rich and delicious gravy. 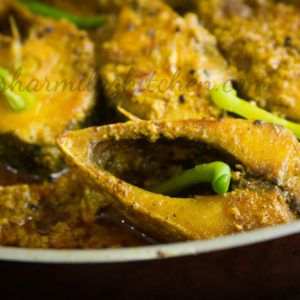 The main requirement of this great fish curry is Rui/ katla fish ((a kind of fresh water carp), mustard oil, Indian spices, yogurt, cashew and poppy seeds paste. Without these ingredients fish kalia can not be outstanding. Yet you can make some variations if the ingredients are not around you. Marinade the fish with salt and turmeric powder. Heat mustard oil. When the oil is hot then turn the heat to medium low, wait for 1 minute and then put your fish pieces in the oil and fry until they are golden brown. Heat 2 tbsp oil with 2 tbsp ghee/ clarified butter. 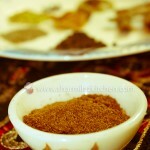 Temper the oil with coarsely pound cardamom, cloves, 1 cinnamon stick and bayleaf. Also add little sugar. Now in a separate bowl add yogurt, red chili powder, turmeric powder, coriander powder, cumin powder and salt. Give a mix. Now add this to the pan and stir well. Then add cashew and poppy seeds paste and cook until the oil separates from the masala. It's time to add water and bring it to a boil. When it comes to a boil add fish pieces and cook for 5 minutes by covering the pan. Once the gravy is nice and thick, sprinkle garam masala powder, green chili and chopped coriander leaves. Now fish kalia is ready to dish out. 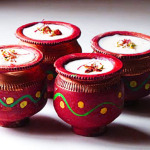 Enjoy with plain rice or pulao. If the recipe goes well for you, rate it, comment and subscribe. Simple and lip smacking. You missed out on the fry the sliced onions after step 4 though. 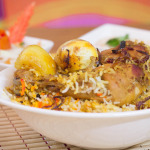 Thank u so much for the marvellous recipe. For the first time i tried bengali fish & it turned out really very well.. Thanks Sharmila for an awesome recipie!!!! Welcome. 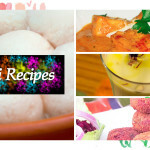 try my other fish recipes..
At what step onion rings to be added?you missed that step. Please watch the video for detailed step.. But what to do with the sliced onions? fry them too [updated].. thanks.. please watch the video..